Much to the chagrin of noted spon-con hater Jamie Lee Curtis, the darling of this year’s Golden Globes is already moving on to bigger and better things. 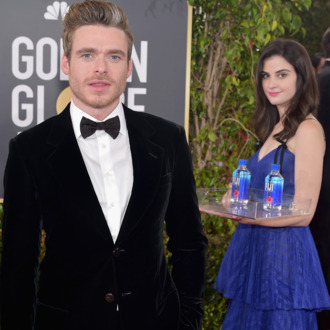 The Fiji Water Girl, or as her birth certificate would prefer you called her, Kelleth Cuthbert, has booked an appearance on soap-opera staple The Bold and the Beautiful to air in February. CBS wouldn’t confirm the story behind her character’s arrival and/or if she would be wearing a blue dress, but Deadline hints it could be more than just a one-episode arc. Cuthbert, who’s still surprised at how quickly she achieved meme status, also posted an Instagram photo from the soap’s set, thanking the cast and crew for working with her. “My brain can’t even comprehend what’s happening or why people are interested in knowing anything about me. It’s such a surreal experience, but I’m having a lot of fun,” Cuthbert, a model, told the Cut earlier this month. “No matter where you move, you’re in somebody’s shot. You just have to look at what you’re doing and be aware of where everyone is. But know that you can’t avoid it. I don’t think there was a point where I made any conscious decision [to lean into the photography]. I think from so many years of modeling, when I hear a shutter, I just kind of give a face.” We can’t say for sure, if given the opportunity, that we would’ve done anything different.